The flood last week was Jeff Bridges’ fourth rodeo. 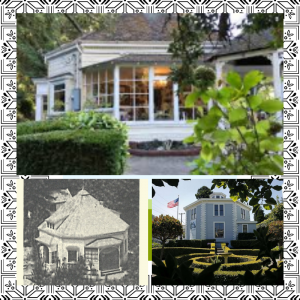 He is the owner of the R3 Hotel in Guerneville. 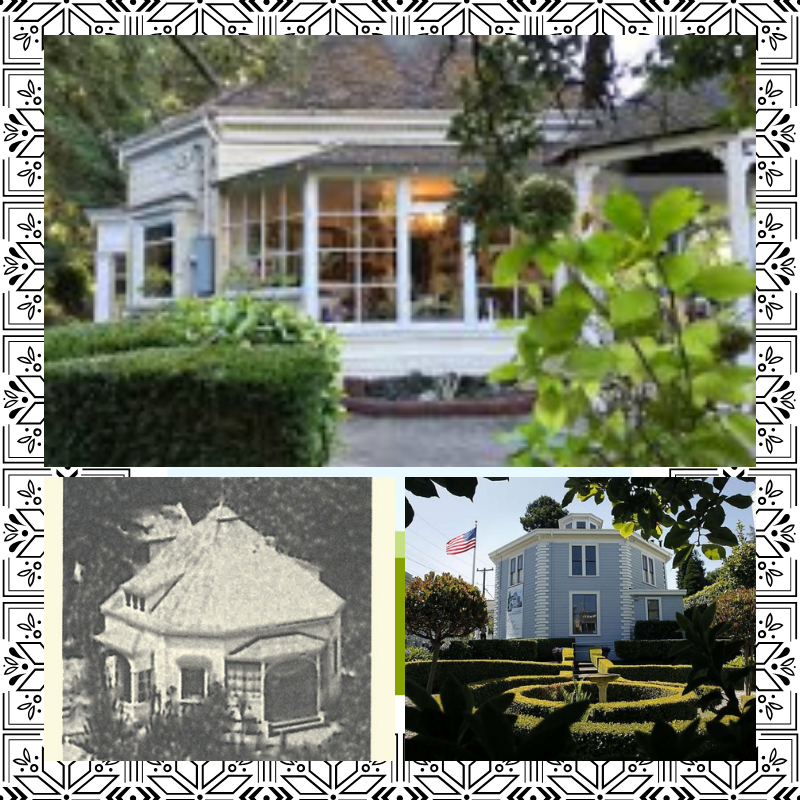 Over eight feet invaded his lodge, bar and restaurant (upper photo). But Bridges was not intimidated. After all, he had had his tetanus shot and was prepared to use lots of bleach and power washers. However, even with protective gear, it is difficult to keep the river crud at bay. 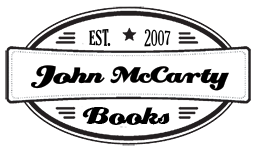 It splashes onto your face and other areas of exposed skin. Some were forced to halt cleanup as sickness set in, diarrhea in full swing. 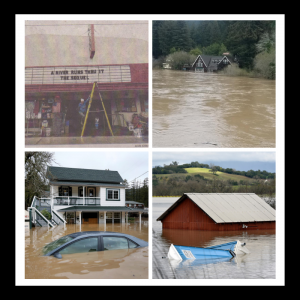 The February 27th flood injured several businesses along the Russian River, including over four hundred commercial or industrial buildings countywide. 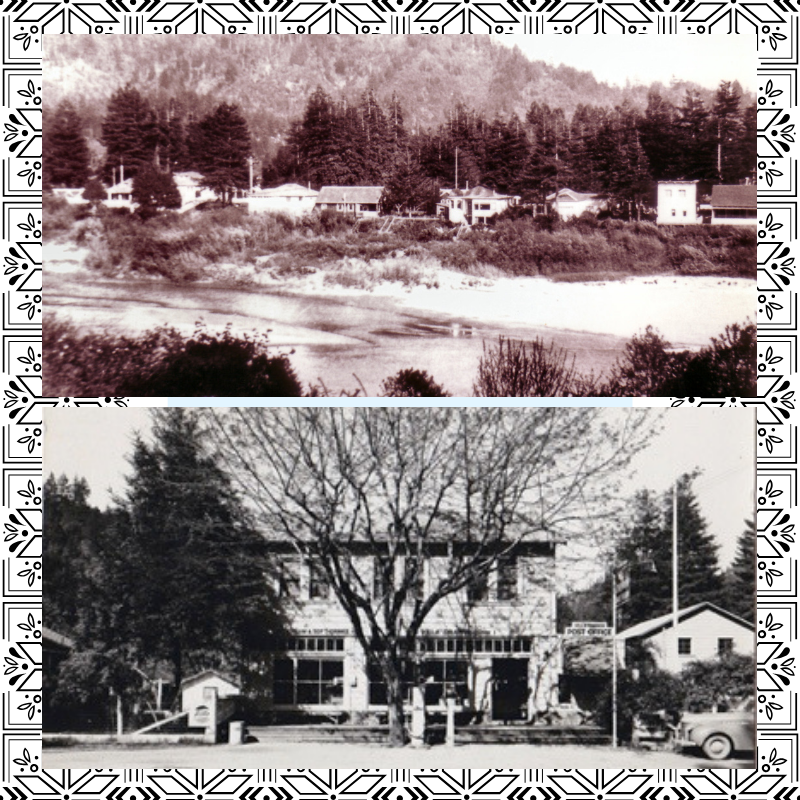 The Rio theater in Monte Rio (upper left photo) had seen this several times before, at least seven times since its construction in 1950, but not to worry. Its iconic piece of Christo’s Running Fence rests high and dry across the theater’s ceiling. The owner, like many hardy souls in the area, owns a sense of humor. Last weekend he changed the marquee out front to read A River Runs Thru It. 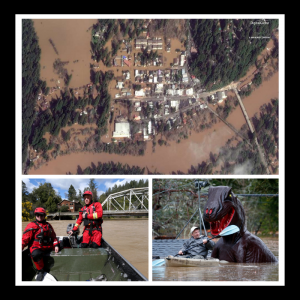 Major flooding along the Russian River in Sonoma County on Wednesday, February 27, 2019 prompted mandatory evacuations and left two towns accessible only by boat (see aerial photo of Guerneville). The river crested at 45.4 feet, the sixth largest flood in the area since recording such events began in 1879. 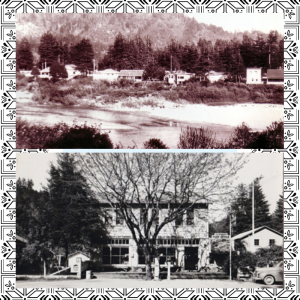 At 33 feet the river crept onto the peewee golf course in Guerneville (lower right photo) and the Mirabel trailer park in Forestville. No big deal. At 39 feet River Road began to close near Hacienda Bridge (lower left photo-rescue workers motor near bridge) and the Triple R Resort in Guerneville flooded. Hmmmm. 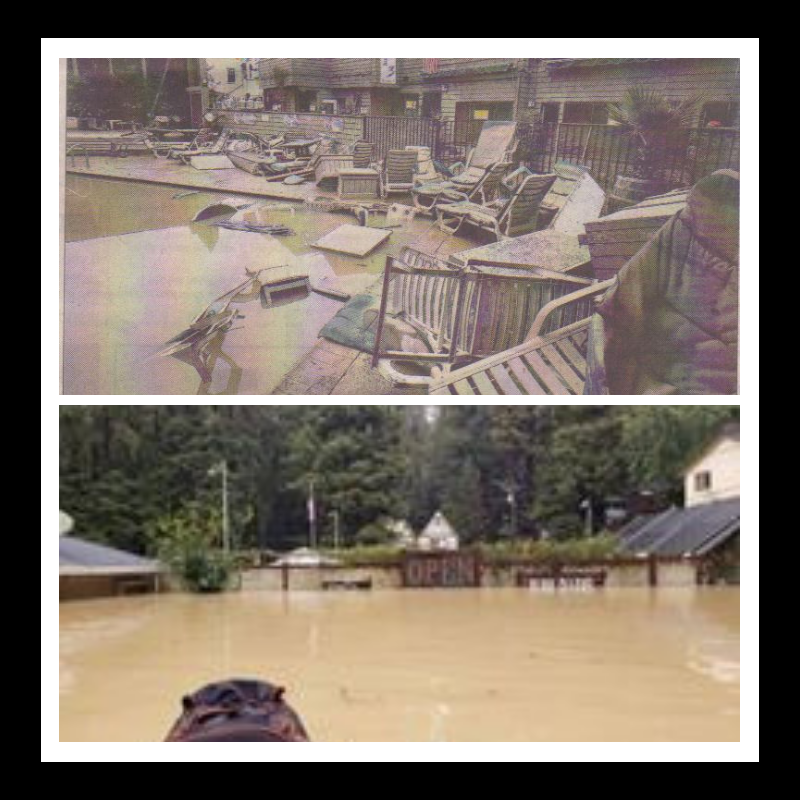 The New Year’s Eve flood of 2005 crested at 41.8′ at the pedestrian bridge in Guerneville (upper photo). 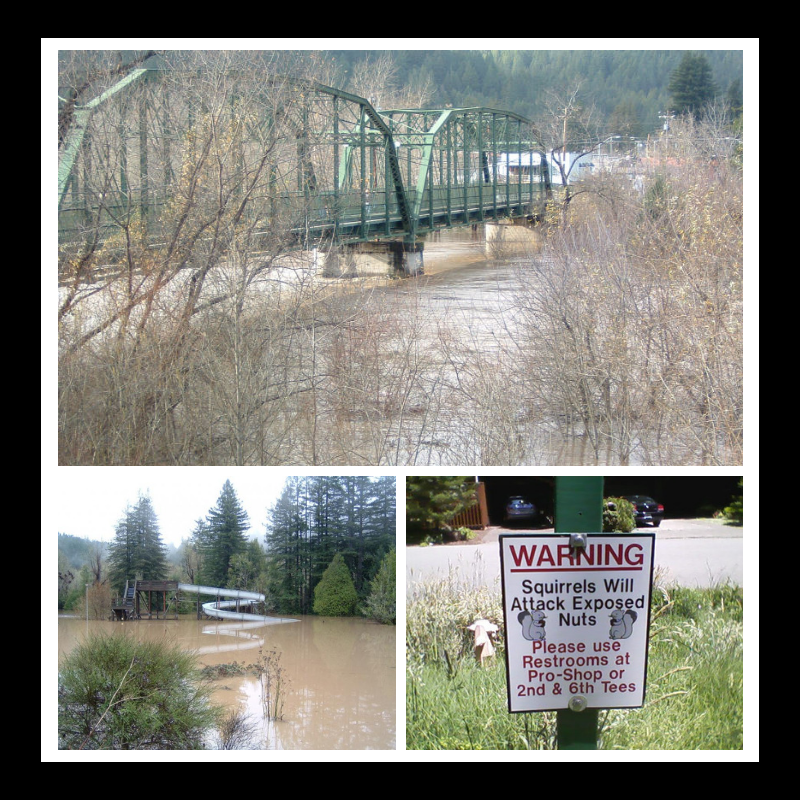 The abandoned amusement park (across highway 116 from the peewee golf course) renders new meaning to the term “water slide” (lower left photo). 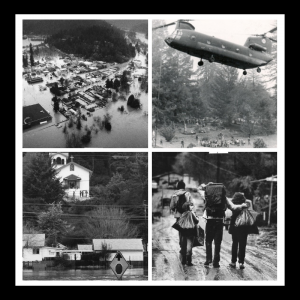 In Monte Rio, the flood of February 18, 1986 reached 48.56 feet, inundating much of the town. 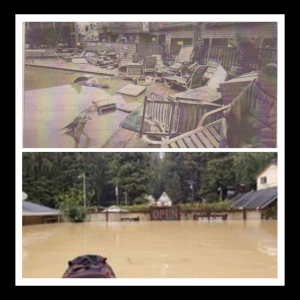 The upper photo depicts the old Highland Dell resort alongside private residences, taking on as much as eight feet of water. 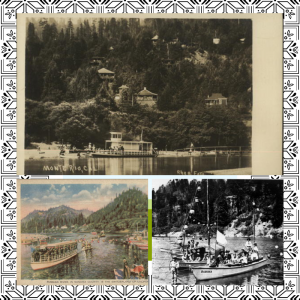 In the lower left photo is pictured a classic. VW buses are great for a number of things—camping, hitchhiking, parking at inspiration point—but fording through water, not so much. You wonder if the driver will get help, or even contemplate returning as the sign above suggests? A wet El Nino swept in a series of tropical storms, beginning February 13, 1986 leading into a three-day weekend capped by Valentine’s Day and Presidents’ Day. 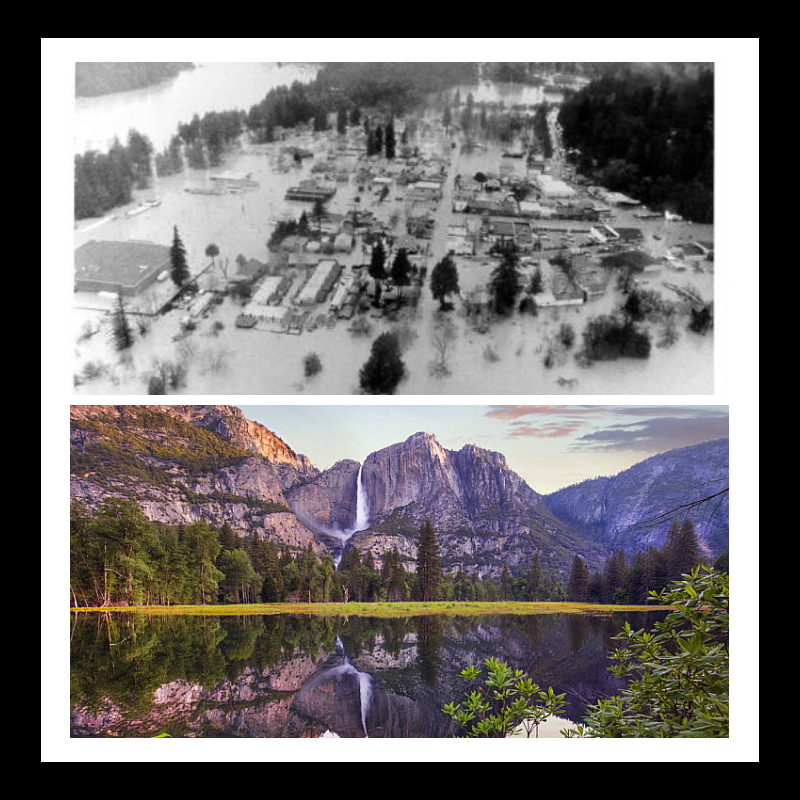 Two years earlier, workers had completed Warm Springs Dam, which held back the flows of Dry Creek, and created Lake Sonoma. Officials said it spared downstream residents what would have been an additional five vertical feet of flooding. But some say that premature releases from the dam increased the water levels (upper left photo). According to the National Weather Service, the floods of 1955 and 1964 were the largest ever along the Russian River. 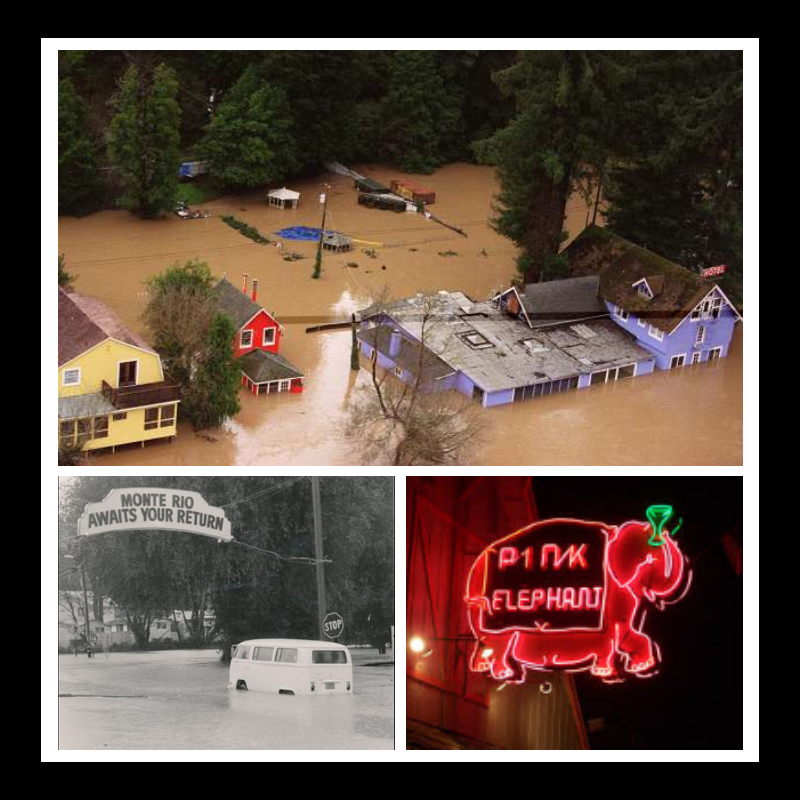 The ’55 flood crested at 49.7 feet while the ’64 deluge peaked at 49.6 with the 1986 flood seeing the river rise to 48.56. 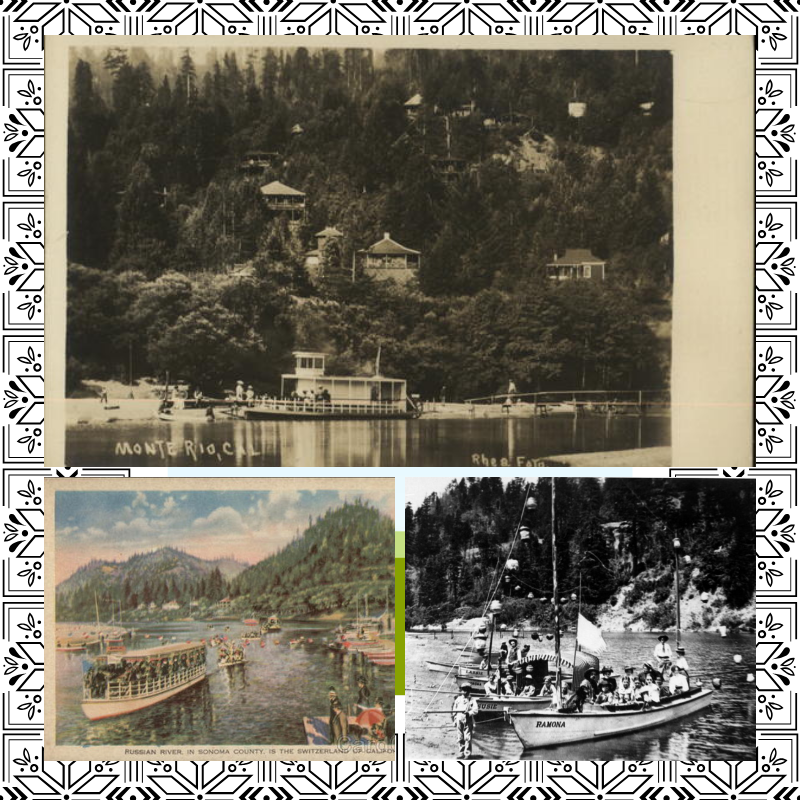 The torrents in the fifties and sixties both occurred during the Christmas holidays.